Our laser projectors are designed so that big, bright, colourful images can be enjoyed, experienced and remembered while forgetting about maintenance. Significant advancements in projection technology means that today’s projectors are brighter than ever, easier to install, and less expensive to maintain. Why? Because they use laser technology, which offers a higher ROI and boast a longer life-span compared with lamp-based projectors, especially for large venue settings and multi-projector setups in exhibitions or museums environments. Thanks to Panasonic's 35 years of experience developing projection technologies, many of the world’s largest auditoriums, concert halls and world-renowned museums have relied on us to deliver superior picture quality and long-lasting reliability. And Panasonic has been at the forefront in developing and introducing the widest range of laser-illuminated projectors in the industry. 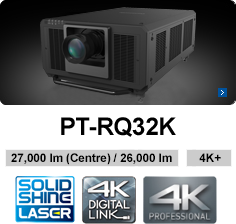 Continuous advancement in laser innovation means that we’re uniquely positioned to create a laser projector with a difference: one that assures up to 20,000 hours of maintenance free operation - for the whole projector – not just the light source, and one that surpasses any of its contemporaries for brightness and colour performance. Panasonic’s SOLID SHINE Laser technology provides solid reliability and long-lasting, uniform brightness that is unprecedented by conventional lamp-based projectors. Utilising solid-state laser light sources and a Panasonic original heat-resistant phosphor wheel, the SOLID SHINE projector range is engineered for continuous 24/7 projection and offers vibrant colours that do not degrade over time. 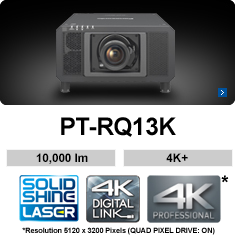 Combining 3-Chip DLP™ imaging with Panasonic's original SOLID SHINE Laser technology, these projectors guarantee crisp images with rich colours on every occasion. 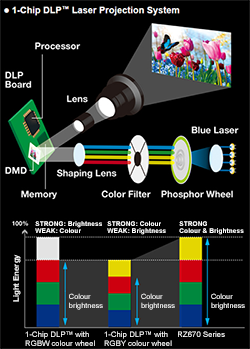 Featuring independent DMD modules for red, green, and blue, and a high-quality Colour Filter Prism for extremely accurate, Rec. 709-compliant colour performance. An expanded colour gamut produces astonishing true to life colours, with improved white balance accuracy for natural and lifelike image reproduction. 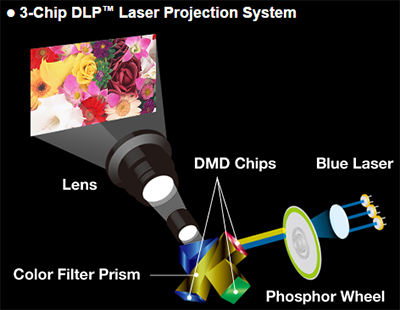 On 1-chip DLP™ models, the outstanding performance of the SOLID SHINE Series stems from a four-segment Quartet Colour Harmoniser colour wheel that reduces energy loss from the light source, boosting perceived brightness and improving colour accuracy. This helps overcome the typical colour versus brightness trade off by eliminating the white segment from the colour wheel and replacing it with yellow. The Quartet Colour Harmoniser reproduces a wider colour gamut than comparable laser projectors, which in turn allows white balance to be more adjustable and whites to appear more uniformly represented on all parts of the screen. 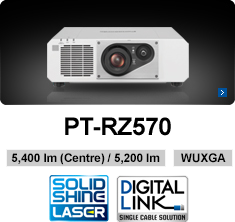 Panasonic SOLID SHINE Laser projectors feature Quartet Colour Harmoniser that allows the white balance to be adjusted to a wider range of colour temperatures than ever before and produces whites with unparalleled uniformity for a natural and realistic picture quality. These maintenance-free projectors are characterised by their long-lasting light-source, low power consumption and dust-resistant air-tight design. Panasonic projectors are tested for dustproof compliance under extremely severe conditions; making them ideal for use in areas with high traffic (such as lecture halls, museums and concert halls) that rapidly accumulate dust; reducing picture quality, and product lifespan. 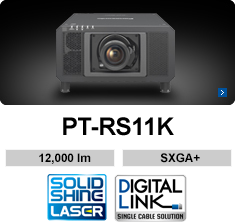 SOLID SHINE Laser projectors feature a unique airtight optical block that exceeds rigorous dustproofing test requirements. It prevents dust from negatively impacting on image quality, enabling 20,000 hours of maintenance-free operation for the entire projector unit. 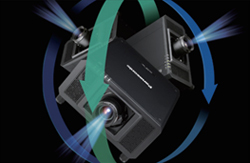 Better still, Panasonic 3-Chip DLP™ Laser projectors add a high-quality air filter and hermetically sealed light source that extends life and maintains picture quality in locations with high dust contamination. 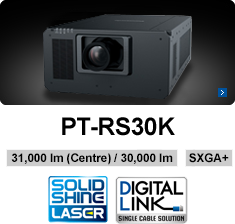 SOLID SHINE laser projectors have a unique cooling system designed to suppress temperature rises by protecting the laser engine and cooling the laser light source modules - even during constant operation and in ambient temperatures up to 50 °C (122 °F)*. This enables dependable operation without the downside of obtrusive and variable fan noise. 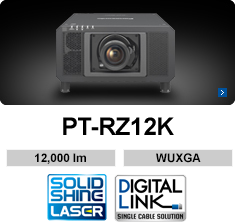 SOLID SHINE Laser projectors offer five different operational modes that help you find the ideal blend of brightness and maintenance-free longevity. This feature is ideal when used in darkened environments such as museums or control and surveillance rooms when full power isn’t necessary. Instead, users can choose up to three lower-brightness Long Life Modes that extend 24/7, 365-day operation up to 87,600 hours (about 10 years* of uninterrupted service) without the need to install a replacement light source. Users benefit from lower running costs by ensuring that the brightness delivered is no more than actually required. *With OPERATING MODE set to LONG LIFE 3. Replacement of parts other than the light source may be required within a shorter period. 24 hours/day × 365 days/year × 10 years = 87,600 hours. 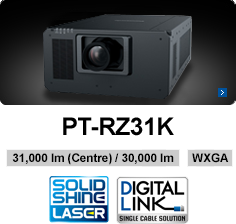 Panasonic laser projectors feature a Dual Drive Laser Optical Engine* that has two discrete light sources that group laser diodes into modules. This means an uninterrupted projection even in the unlikely event a light source fails – which is ideal for mission-critical applications and high profile events. It also helps minimise brightness and colour degradation over the 20,000-hour maintenance-free service life. 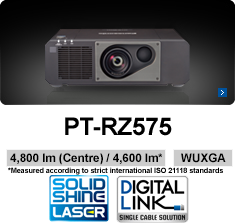 SOLID SHINE laser projectors can be installed safely in any orientation (vertically or horizontally) and rotated 360 degrees at any angle, allowing for a versatile range of environments and applications. 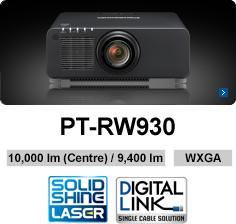 SOLID SHINE Laser projectors can be used at higher elevations than lamp based products - up to 4,200 m*—with comparably less reduction in brightness. All Panasonic projectors go through rigorous reliability tests, so you can be assured of a product that meets the highest standards of manufacturing quality, and a product that is designed to last. 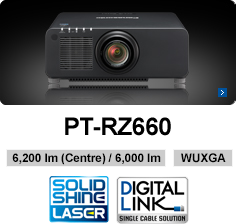 You would like to know more about Panasonic offers in laser projection or you have a project you want to discuss with us, please contact us here.